Perhaps to make the upcoming Valentine’s day more special, Tinder dating app and Ford UK have cooked up a special blind date for all the single blokes and chicks in the block. The Valentine treat consists of a date (or a hookup) onboard a Ford Mustang GT convertible. Here’s how it all began. Aside from finding a new partner, the contest policy is probably the most exciting part of this whole thing. The real user profile is anonymously hidden under a photo of a Ford Mustang. So as you can see, there’s an element of mystery to start with. If you happened to be one of those who are interested, all you needed to do was “swipe to the right” when you see a profile that says; “It’s the date you’ve been waiting for, Ford Mustang wants to take you on a blind date like no other”. As days went by, about 1.5 million singles have tried their luck on the special online event. But out of all those who signed up, only 5 lucky pairs were chosen. To show it to the whole world, the five lucky couples went on a blind date riding in a yellow convertible Ford Mustang GT complete with video footage. The pre-Valentine campaign was made possible by WPP Blended Team and Gaucho Productions. Ford Motor Company EVP Jim Farley thinks that since a Ford Mustang is an iconic car that makes heads turn quite literally, showing up for a date with a GT convertible would definitely be a “good start”. On the other hand, Tinder’s Derek Callow strongly believes that the Mustang has changed the people’s perception regarding American sports cars in general. In a way, Tinder has also changed the dating scene that’s why for them, it only makes sense that they work together to build new connections. While on the way to a drive-in movie, the couple was asked several questions by host-comedian Jarred Christmas just to help break the ice. As it turns out, the comedian was more talkative than the couple he is with. At least there are no awkward moments when you have no idea what to say to your blind date, right? Overall, we think the Ford Mustang should be declared as the true winner here. After all these years, the iconic American muscle car with 52-year history has proven that it has what it takes to make it to the 21st century dating scene. In our opinion, it would have been more memorable had they used the 1st gen GT convertible instead of the latest model. Regardless, the event was a real success. Cupid had his work cut out as five lucky couples enjoyed blind dates in a Mustang – after more than 1.5 million users interacted with the car on the Tinder app. 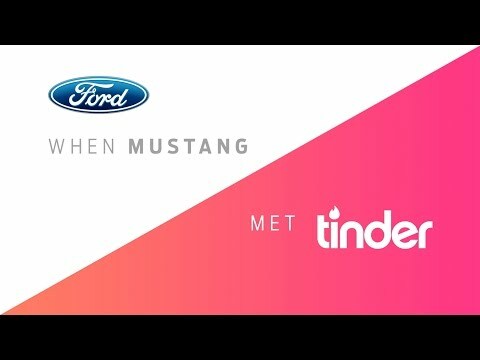 The couples were matched up after swiping right on a profile that said: “It’s the date you’ve been waiting for – Ford Mustang wants to take you on a blind date like no other”. They then hit the road in London for a date that ended up at a retro drive-in movie for two. Getting to know each other on the way, couples were quizzed by TV comedy star Jarred Christmas on everything from “belfies” to secret tattoos to help break the ice. “It’s got to be a good start to show up for a date in a Ford Mustang. It’s an iconic car with a built‑in ability to turn heads” said Jim Farley, executive vice president and president, Europe Middle East and Africa, Ford Motor Company. “The Mustang forever changed the way that people think about American sports cars. Tinder has changed the way that people meet. It made sense for us to work together and spark some new connections,” said Derek Callow, vice president international, Tinder.